All 12 cat blocks have been made – 6 facing right and 6 facing left. The empty spaces will be filled with red flowers. I really like how this is looking. I have had this pattern for long time – maybe 7 or 8 years. However there were parts of the design that I didn’t care for, so ideas for “fixing” the pattern have been floating around in my head. 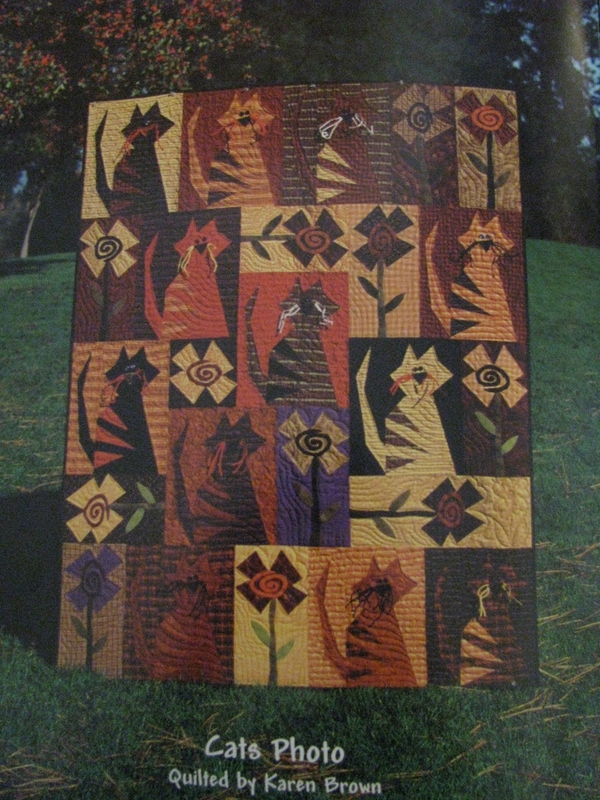 Here is a picture of the quilt from the book That Crazy Thing We Do by Buggy Barn. I like the cats, but I have a problem with the flowers growing sideways. 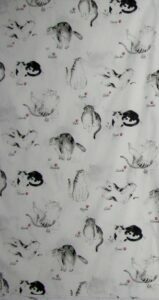 So my plan is to replace the stems blocks with blocks of this black cat fabric. 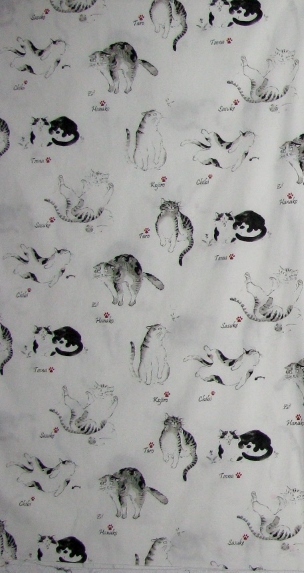 This fabric also decided the color selection for the quilt – black & gray with some red. The next part was deciding to replace the small rickrack whiskers with embroidery whiskers. 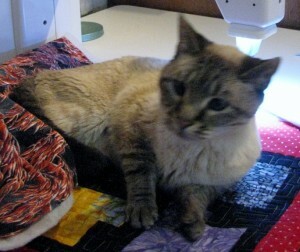 My quilt is more serious than the original so embroidery whiskers seems more appropriate. 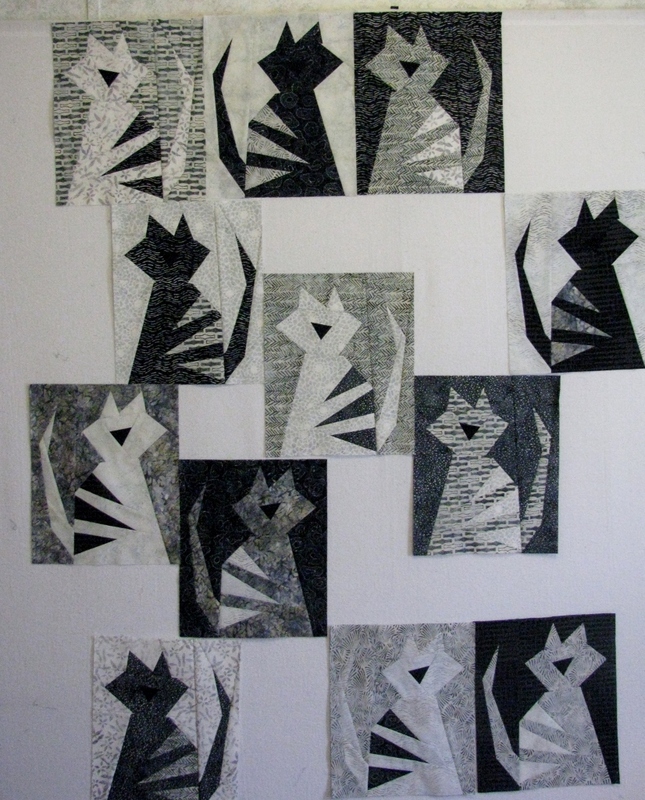 The idea to have half of the cats facing left just popped into my brain. I think it adds some interest and movement to the quilt. The last change I will be making is to add the name “Gus” to one of the stem replacement blocks. Gus is my name for this quilt and it is in memory of my quilting companion who passed away last year. 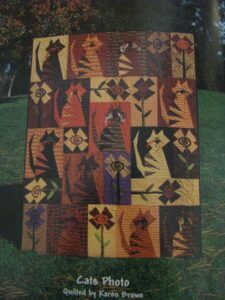 I enjoy reading about the design process on other quilter’s blogs, so I thought that I would record some of my thoughts. We must be sisters from the same cloth! The sideways flowers would bother me, too, and I’d have to have some cats going the other way, as well.